Pre-1890s cruisers were often sail/steam thing intended to safeguard the immense colonial trade roads of the Empire. 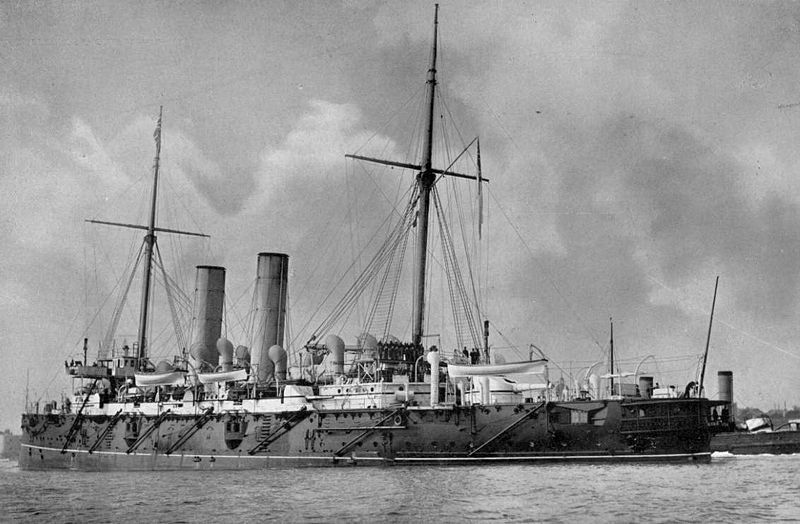 By 1890s the concept of protected cruiser was well accepted as more “military” ships compared to 3rd rate ones, barely better than enlarged gunboats, but still cheaper than armoured cruisers. Born from the 1889 program, these 9 cruisers were smaller versions of the Blake (1890),yet with the same protection and armament. Machinery was reduced and the tonnage lower by 1800 tons. However these new steam engines gave 20 knots and had a better range of 10,000 nautical miles. Tests proved their great endurance. 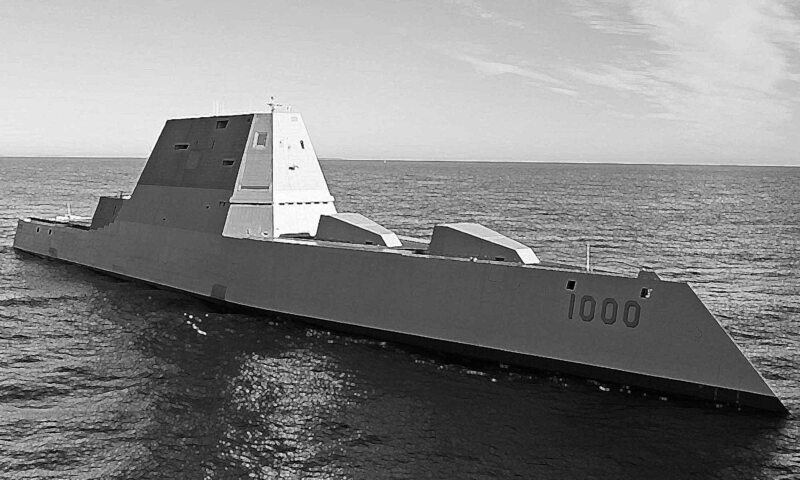 These ships could sustain 18 knots for 48 hours. They also had better seaworthiness in bad weather and were well suited for the north sea, although intended as local “capital ships” for distant stations. Four units, the HMS Gibraltar, Crescent, Royal St Georges, Royal Arthur were built by using large amounts of wood and copper for their (tropical) service overseas. The Royal Arthur and Crescent were slightly different, having both a raised forecastle, improving living quarters and holding heavy weather. Heavier by 350 tonnes, they also had two 152 mm guns at the front instead of a single heavy 234 mm gun in the axis as their sister ships. 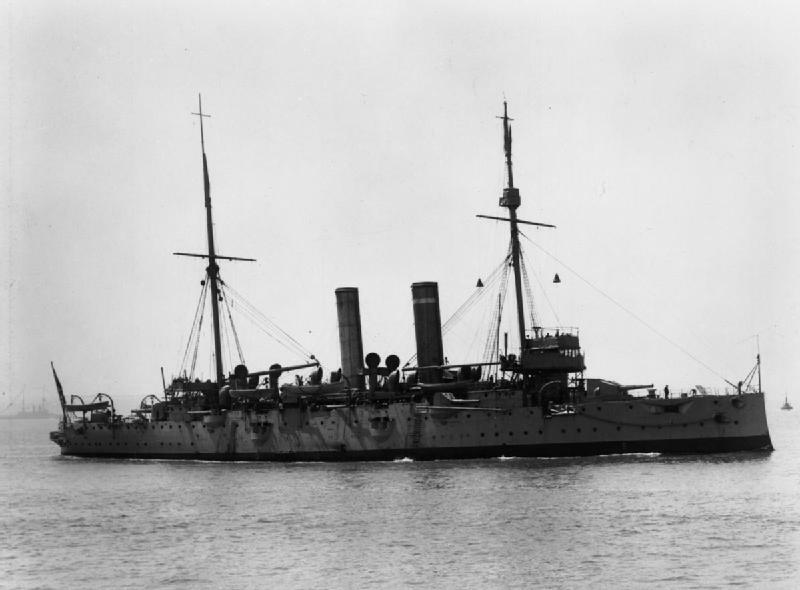 HMS Crescent was part the 10th cruiser squadron in 1914, patrolling in the north sea. 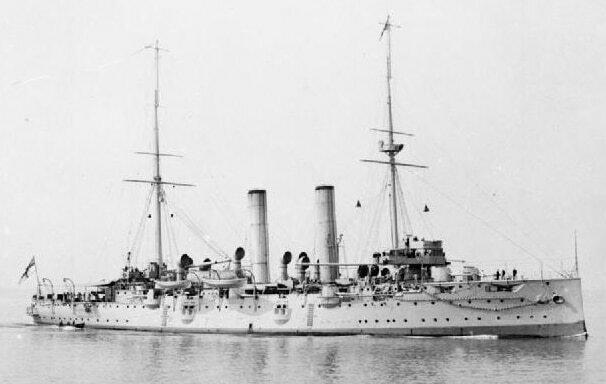 In February 1915, she was assigned to the defense of Hoy. In November, she was disarmed and converted into an anchored tanker in Hoy. She then joined Rosyth to be reformed in 1918. HMS Edgar operated together with other units of the same class with the 10th squadron operating in the North of Scotland. In November-December 1914, her heavy guns were removed to be given to the new monitors. She was then kept at anchor, and later rearmed with 12x 152 mm guns and fitted with large side ballasts in order to carry out bombing missions on the Flemish coast. 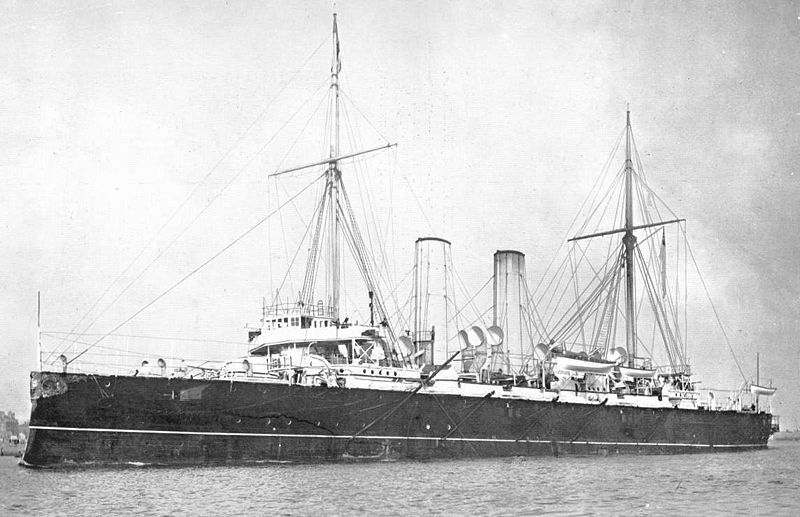 In May 1915, she was transferred to the Dardanelles and served there until 1918, date of retirement. HMS Endymion was assigned to the 10th Wing also in 1914. she was then disarmed, rearmed and equipped with ballasts like the Edgar to serve in Flanders, but was transferred instead to the Dardanelles. She then served in the Aegean Sea and was decommissioned in 1920. 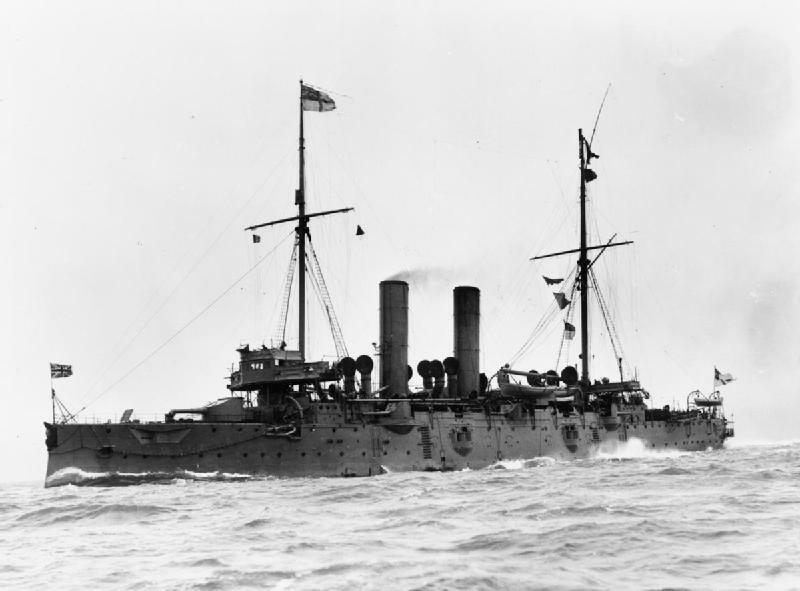 HMS Gibraltar served with the 10th Cruiser Squadron. In March 1915 she was disarmed and anchored to the Shetland Swarbacks Minns islands to serve as tanker for the 10th fleet, starting in June 1915. She was then sent to Portland to be assigned to a diving school. She then became a destroyers supply ship from 1919 to 1922. HMS Grafton was affected to the 10th flotilla in 1914. She was then disarmed from its heavier guns, then rearmed and equipped with side ballast, for Flanders bombings. She was sent in mid-1915 to support the Dardanelles landings. On 11 June 1917 she was struck by a torpedo from a German U-boat, but survived and was towed for repairs. 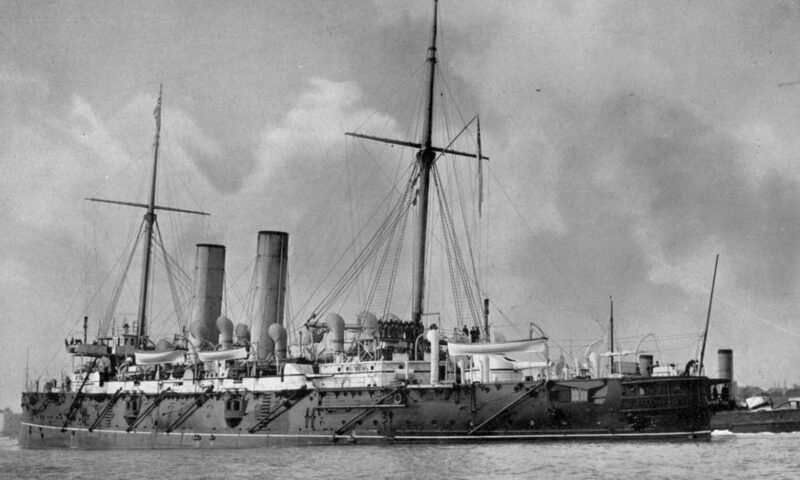 She then served in the Aegean until the armistice, then the Black Sea in support of “white” Russians as flagship. She was disarmed and demolished in the end of 1919. 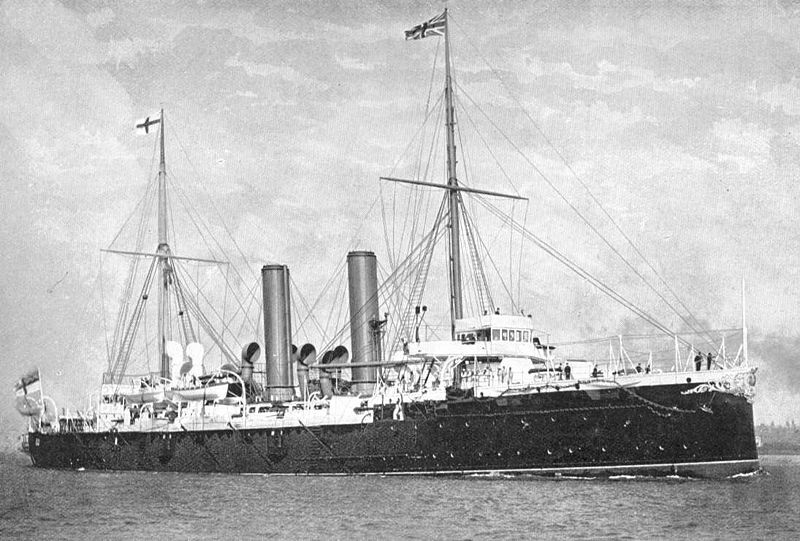 HMS Hawke served with the 10th squadron, North Sea, in 1914. She narrowly escaped sinking after a collision with the large liner SS Olympic. 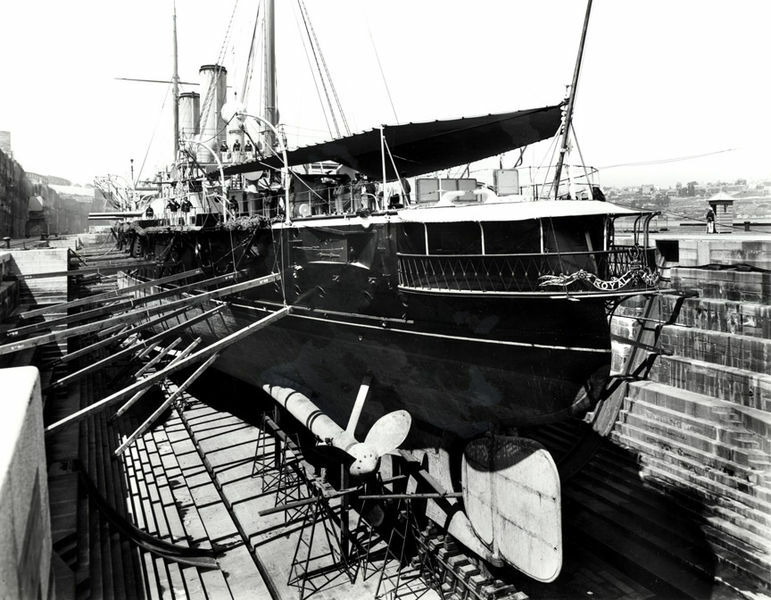 She lost her bow and was repaired but its spur was removed during reconstruction. 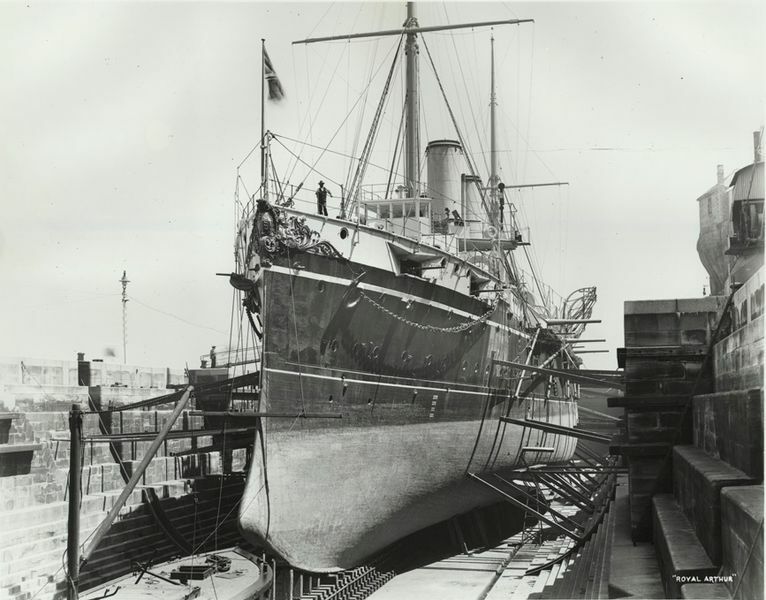 She served from 1908 to 1913 in Portsmouth, after being briefly a training ship for cadets. She was torpedoed in mission on October 15, 1914 by the U9 and sank with 524 hands. HMS Royal Arthur was detached to the 10th squadron in 1914. In February 1915, she was reduced as a submarine supply ship, a role she held until 1919 in Scapa Flow. She witnessed arrival of the great Hochseeflotte and was later disarmed. 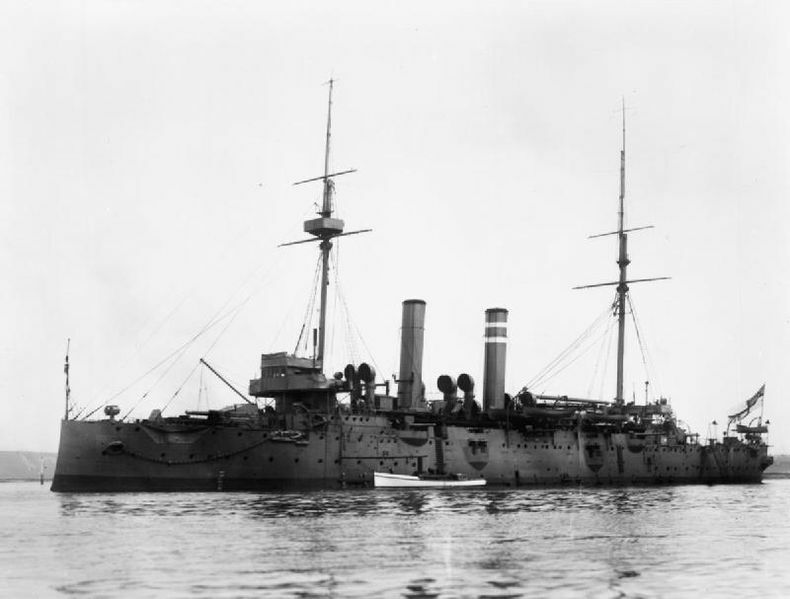 HMS St George was put in reserve, having served for the training of sailors student, in 1906. She also served as a supply ship, and was converted to Chatham for that very purpose from 1909. She served with the 9th flotilla of destroyers in November 1914, and later for patrols in the Humber. In 1917 she was converted into an armed tanker for submarines, and sent in the Mediterranean. She served in the Aegean Sea in 1918-19 with the second flotilla and was retired in 1920. 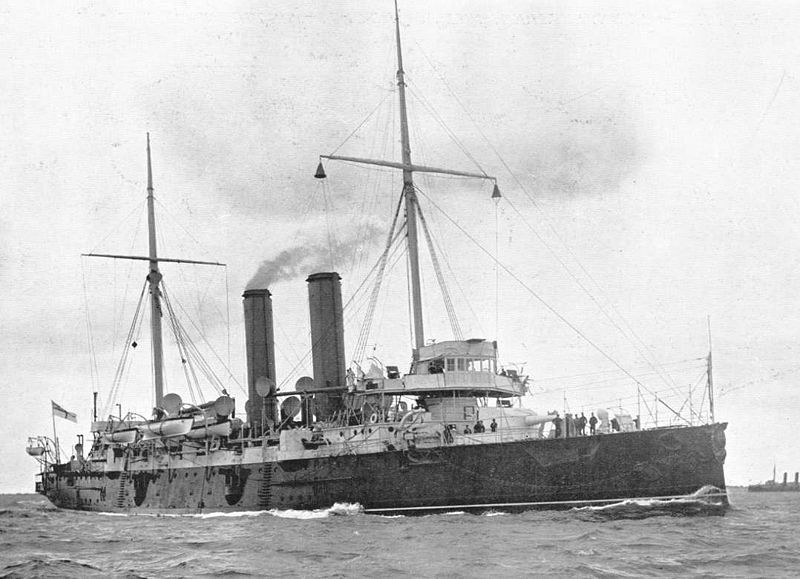 HMS Theseus served as tanker HMS Cambridge from 1905 in Devonport. In 1914 she was affected to the 10 squadron operating in the North of Scotland, and then was transformed in early 1915, rearmed with 152mm guns and fitted with ballasts to operate in Flanders. She was then sent to the Dardanelles and served in the white sea in 1916, before returning to the Aegean to serve as tanker, then the Black Sea in support of the “white” Russians. She was retired in 1920. HMS Grafton in wartime livery. Specs Conway’s all the world fighting ships 1860-1905. 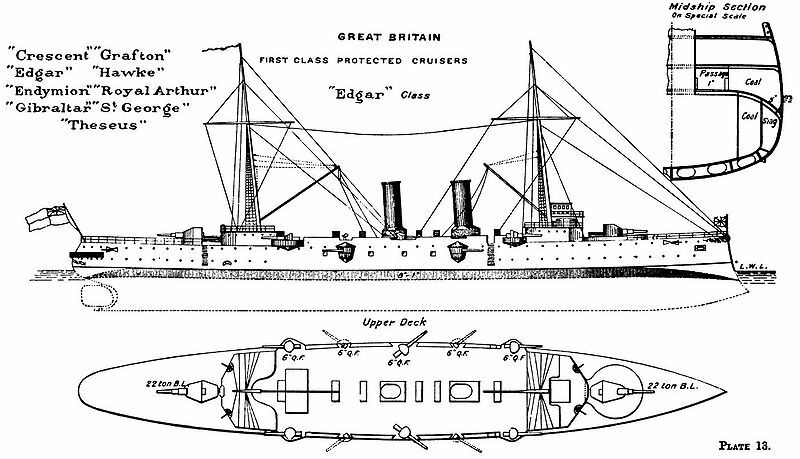 HMS Edgar illustration in 1914 (notice the raised forecastle).